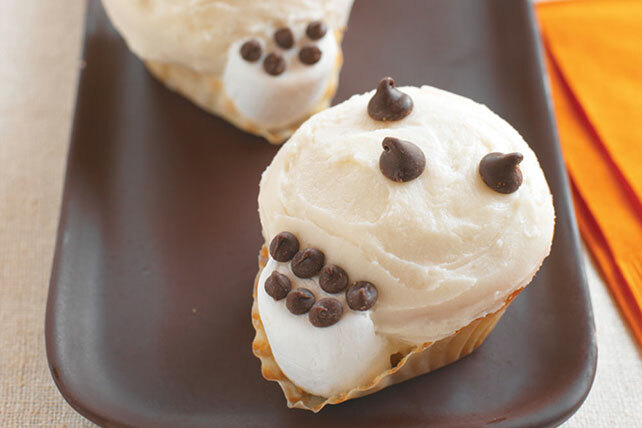 Halved marshmallows stuffed between cupcakes and their paper liners help turn everyday cupcakes into Halloween party Skull Cakes. Prepare cake batter as directed on package; blend in dry pudding mix. Spoon into 24 paper-lined 2-1/2-inch muffin cups. Bake as directed on package for cupcakes. Cool completely. Beat cream cheese, butter and vanilla with mixer until well blended. Add sugar gradually, beating well after each addition. Pull each cupcake liner partially away from cake. Place a marshmallow half between paper and cupcake to create skull's jaw. Frost cupcakes with cream cheese mixture. Decorate with chocolate chips.